Roughly defined, space weathering is the interaction of meteorite impacts, solar wind sputtering and other agents on the surface of an airless body, and the resulting changes. Although this process makes only tiny changes to the surface of individual soil grains, the accumulation of these changes alter the reflectance spectrum (colour) of the surface as a whole, making remotely determining surface composition challenging! Without an atmosphere to protect them, the surfaces of our own Moon, the planet Mercury, and various other small bodies and moons in the Solar System are continuously exposed to a rain of meteorites, radiation and energetic particles. Each of these processes deposits energy into a very small area, resulting in microscopic changes to the outer surface of grains. 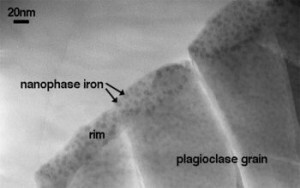 It is now thought that a combination of processes result in the changes we ascribe to weathering – very fine grains metallic iron is formed at the very outer layers of some grains, whilst melting of regolith can produce glassy particles. An example of one such grain is shown in the image on the left. This grain is made from the mineral plagioclase (a mineral which itself contains no iron). On the outside of the grain, the dark inclusions are very fine grained metallic iron, with diameters of a few nanometres (which is pretty small – the head of a pin is about a million nanometres across!). It is believe that this iron is produced when ions and micrometeorites hit surrounding (iron containing) minerals, and can coat nearby grains with vaporised or sputtered material.